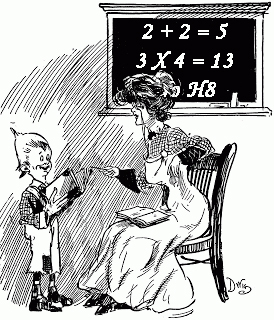 Common Core standards, created whole-cloth from the minds of the Obama administration, are seeking to burn down the straw-man of “rote memorization” and building “understanding” as a path towards building mathematical knowledge. In the below video, a teacher training session explains why even if a student ” said 3 X 4 was 11, if they were able to explain their reasoning and explain how they came up with their answer, really in words and oral explanations and they showed it in a picture but they just got the final number wrong; we’re really more focusing on the how and the why.” It’s like insisting on a formal proof that 1 + 1 = 2 before teaching basic arithmetic! This is a false choice. It is necessary to teach why things are done in a certain way and what it is that those mathematical manipulations. It is also necessary to show them and have them practice these mathematical techniques so that they can understand and get a feel for them. If you can’t actually do it, then you don’t really understand it. Plenty of valid mathematical techniques are put off or delayed while children are told to understand, without actually knowing what it is they are supposed to understand! In order to pass these tests, no actual demonstration that the ideas are known and understood is necessary, only a regurgitation of quotes about understanding it. The only thing Common Core teaches is how to parrot the talking points provided by an authority figure. Of course, that’s not a flaw; It’s by design. This entry was posted in Education, Progressives and tagged Obama. Bookmark the permalink.